Joseph Lelang is the current Member of Parliament for Kandrian and Gloucester in West New Britain. He is also leader of the Coalition for Reform Party. Before entering Parliament in 2013, Lelang served two years as Secretary in the Department of National Planning and Monitoring; a period marked by several high-profile scandals that continue to re-emerge through the courts. Joseph Lelang has been a key witness in the prosecution of both Eremas Wartoto (2017) and former Minister Paul Tiensten (2013); has been heavily criticised in an investigation by Task Force Sweep (2012); and has himself been the subject of Leadership Tribunal (2013) where he pleaded guilty on four counts of misconduct in office. Since becoming an MP, Lelang has registered three private companies that he either owns or jointly owns. According to his Parliamentary profile, Joseph Lelang was educated mainly in Port Moresby. First at the St. Francis Community School, Koki from 1976-1981 and then De La Salle High School, at Bomana from 1982-1985. He then completed Grades 11 and 12 at Passam National High School, in East Sepik from 1986-1987. After finishing High School, Lelang returned to Port Moresby to study at the University of Papua New Guinea. He graduated with a Bachelor of Economics Degree in 1992 and later studied for his Master of Philosophy in Economic Planning in the United Kingdom (1996-1997). From 2008-2010 Joseph Lelang was Secretary of the Department of National Planning and Monitoring. In that role he was referred by the Ombudsman Commission to a Leadership Tribunal over his failure to submit Annual Returns. It was also as Secretary that Lelang was involved in a number of controversial payments, including two to companies controlled by Eremas Wartoto. Those payments led to two criminal convictions for the businessman, who is now serving lengthy prison sentences for misappropriation, and a conviction for former Minister Paul Tiensten, who is serving a 9-year sentence. Lelang entered Parliament as MP for Kandrian-Gloucester in West New Britain in 2013. Lelang was the founding member of the Coalition for Reform Party (CRP), but following his election in 2013, he joined the ruling People’s National Congress under Prime Minister Peter O’Neill. In January 2017, ahead of National Elections, it is reported, Lelang resigned from the PNC and rejoined the CRP. Joseph Lelang has not allowed his duties as an MP to get in the way of business. Kandrian Oil and Fuel Distributers Limited was registered in February 2014, eight months after Lelang was elected to Parliament in June 2013. The company is jointly owned by Joseph and Nancy Lelang who are also the only Directors. The following year, in April 2015, New Britain Importers and Distributers Limited was registered with Joseph and Cynthia Lelang as joint owners and sole Directors. 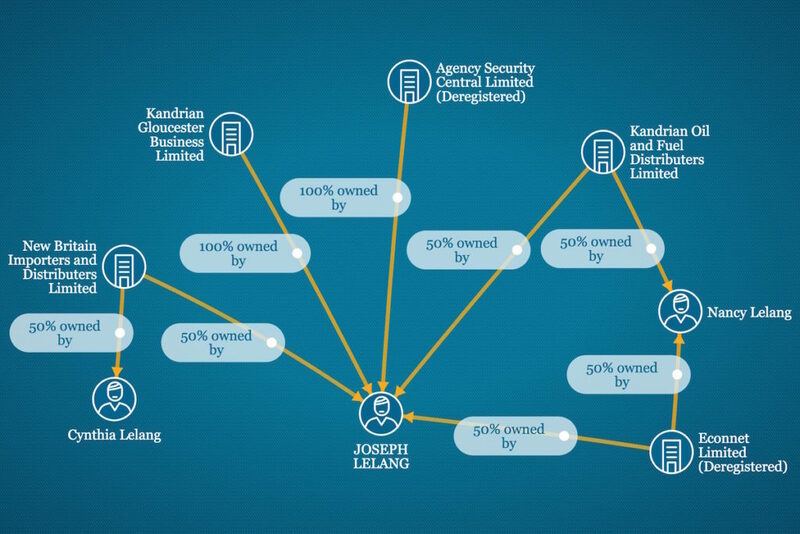 Finally, in April 2016, Kandrian Gloucester Business Limited was registered with Lelang as the sole Director and Shareholder. These companies are not the first Lelang has been involved in. From 2000 to 2005, Joseph and Nancy Lelang were the joint owners and Directors of Econnet Limited. The company has now been deregistered. From 2003 to 2005, Lelang was the sole shareholder in Agency Security Central Limited. The company was deregistered in 2005. The misappropriation of over K6 million for repairs and maintenance at Kerevat High School. In 2017, Wartoto was found guilty of misappropriating the K6.4 million of State funds intended for the maintenance and repair of Kerevat High School. Joseph Lelang was called on to give evidence at the trial of Mr. Wartoto. In his role as Secretary of the Department of National Planning and Monitoring, he approved and facilitated the payments. It has been reported that at Wartoto’s sentencing, the same judge went further and accused Lelang of having lied in giving evidence against Wartoto and recommended Lelang be prosecuted. In November 2013, former Minister for National Planing and Monitoring, Paul Tiensten was found guilty of dishonestly applying K10 million belong to the State to the use of another. The charge related to an alleged dishonest payment of K10 million to Eremas Wartoto’s company, Travel Air Limited. Joseph Lelang was a key witness in the trial of Tiensten. It was Lelang in his role as Secretary in the Department of National Planning and Monitoring who had implemented the Minister’s direction to pay the K10 million. The court found the payment was made outside proper departmental processes and procedures and without adhering to the Public Finance Management Act. Lelang gave evidence that he was ‘compelled to implement’ the Minister’s direction to make the payment and that if he did not he would have been disciplined and charged for insubordination. The evidence of Joseph Lelang, if true, raises serious questions about the conduct of senior public servants. Do they regularly breach proper processes and procedures when instructed by their Minister? Should the fear of disciplinary charges really be a sufficient defence to what could amount to criminal conduct or the facilitation of illegal payments? If Departmental Heads are not able to stand up to and direct Ministers on what is and what is not lawful then how is the law to be upheld? In 2013, Joseph Lelang faced a Leadership Tribunal on four counts of misconduct in office. Two counts were for failing to submit annual statements to the Ombudsman Commission and two counts were of failing to comply with directions from the Ombudsman Commission. All four offences, which Lelang admitted, were committed while Lelang was Acting Secretary and Secretary in the Department of National Planning and Monitoring. The Tribunal fined Lelang K1,000 for each of the four offences, K4,000 in total. In 2012, the Investigation Task Force Sweep conducted an inquiry into allegations of corruption at the Department of National Planning and Monitoring. In its report, the Task Force identified a considerable number of sizeable payments, each over K1 million, allegedly approved or facilitated by Joseph Lelang as Secretary. Sweep claims this occurred outside proper processes and procedures. The report recommends Mr. Lelang be referred to the police fraud squad for investigation in respect of a number of the payments.